What kind of MZ glass ? When I first purchased it ,money was tight and I went with a cheap scope . I have more of a budget now and was curious what you guy are using . I would typically spend the money for a good scope but the smoke pole really only sees 2 weeks of use a year . What are you guys using ? Ive decided that flip up caps are 100 percent necessary . I can't count the number of times ive gotten snow and ice built up on the glass while walking through brush. I have a bushnell elite on my 30-06 , ill look around and see what I can find . Hi lux. Never heard of it? Neither did I. But it has performed flawlessly. Clear and never fogs. Held zero for the last 5 season. And not overly expensive. Love it. i don't have much experience with scopes on smoke poles. about 10 or so years ago i bought the Nikon Omega 3-9x40 when it first came out. worked fine since. haven't changed it. i've gotten it to hold sub-MOA at 100 yards. My 50 caliber TC Omega is topped with a Nikon BDC 3-9 X40. Use (3) 50 grain blackpowder pellets sight ML out to 100 yards and the dots are good out to 300. Its has nice clear glass and reticle/dots are clear and noticeable as well. Has put a hurtin on quite a few deer. I'd even add a cabelas brand scope to my list, I have one and for the 90 bucks I spent the glass is very impressive. I've got a Bushnell 4 power. Don't plan on shooting farther than 150 yards with mine and I love the circle X reticle. Just put the circle on the kill zone and touch it off. 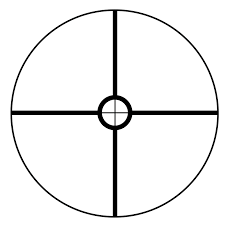 The circle is bolder and I have just gotten to like this reticle so much almost all my scopes are this. Can also get them in a 3x9. I'd be looking for a second hand Leupold variX II 4x, 2-7x or 3-9x........good old duplex reticle is all you'll really need. I don't see the need for all the circles, hash marks etc for a ML rifle. Of course, YMMV. Ya,i don't use it anywhere that I could shoot over 100 yards ,simple crosshairs will do . My biggest complaint with the cheap one is fogging and ice . I broke down and bought the Nikon inline XR scope, very nice. I take the muzz out a few times during the regular season in addition to the ML season. Optics Planet and Natchez sometimes have smoking deals on factory refurbs...the Nikon I bought for my .223 is a refurb, performs flawlessly and was $90. I run a Vortex Crossfire II 3-9x40 on mine. Does the job. I'm sold on the Bushnell scopes with Rainguard. I have the a couple of the Elite 3200's and they never fog and stand up to weather beautifully. I'll be getting either a 2-7 or 3-9 to replace the "package" scope that came on my CVA. Not the brightest scope I have ever owned, buy certainly the most hassle-free. I use a bushell 3200 elite with firefly, but in 1.25-4.5x32mm. They do not make the scope anymore. This is my general advice with any scoped firearm for hunting in NY. -Lower power the better. Field of view at close ranges is very important. -Thick recticle to see it in low light or quicker shots better. -Buy a better scope mount than a scope. Or buy good both of them. I've seen much more scope mount failures than scope failures. 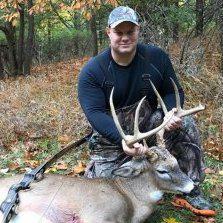 I use a scoped muzzleloader as a loaner gun. My go to muzzleloaders are (1) a peep sighted lyman gpr flintlock with glow in the dark painted front sight, (2) a built by me 45 cal flintlock with open sights, or (3) a 45 cal caplock with open sights if the weather is on the nasty side. I do use the scoped inline when the weather is horrible. Better to use modern than nothing at all in my book. What ML/load are you using ? I have a 2-7X Redfield low-profile widefield on my T/C Omega 50 cal, shooting 100 grains of triple 7. That combination has been deadly on deer every time (about a dozen total) out to about 200 yards. The energy gets a little marginal out that far, but the accuracy is still very good. 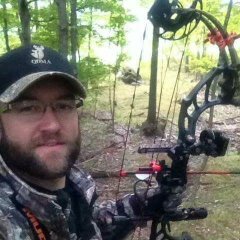 Quite a few years ago, I Iearned a hard lesson when I gave up tracking a deer I thought I had missed at that range a little too soon. Now I limit my range to about 150 with it, only use it during ML season, and assume EVERY shot is a hit until PROVEN otherwise. Fortunately, I have not struggled to find a deer that I shot at with any weapon, in the dozen or so years since that mishap. I use a Vortex 4x12-42 on my CVA. Probably a bit more scope than a muzzy needs but it was on sale so I snatched it up. Works great with no issues. Vortex is known for a hassle free warranty so that’s a bonus. Have you ever looked into a neoprene scope slip cover vs the flip up caps? I like the neoprene covers because they protect the entire scope from the elements and bumps while walking. Use two zip ties to hold the cover onto the scope and all you do is slip off each end quick when you want to make a shot. Excuse the green paracord used in that pic. I had just got the cover and didn’t have zip ties with me at the time. Zip ties are where the paracord is and looks much better. Fortunately, I have not struggled to find a deer that I shot at with any weapon, in the dozen or so years since that mishap. You hit the nail right on the head there. That is always the first thing I do when I find them. Like Robhuntandfish mentioned, you first need to establish where you'll be using the scope & the possible longest shot that can be made. Where I hunt, smaller woodlots surrounded by thickets, the furthest shot for me is ~100yrds with most in the 50-80yrd range. So, the need for my scope would have been over-kill to think about a 3-9 or 4-12 variable scope. Lot of benefits to a 4X fixed power scope if long range shooting isn't a requirement. Lower cost, wider field of view, never an issue with which BDC/X-hair to aim with, etc. BTW - flip-up scope covers can be an add-on, purchased at a lot of different places on web or retail.